It could’ve been the Trekkies of Bruce Springsteen fandom. Instead, the Ridley Scott-produced Springsteen & I is an overly reverent – though not lacking in entertainment value – paean to The Boss. 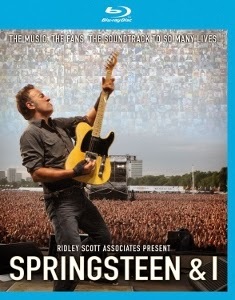 Though directed by Ballie Walsh, this documentary was essentially made by Springsteen fans, for Springsteen fans. Invited to share their stories and memories, fans from around the world (mostly using consumer-grade cameras) submitted short videos. The filmmakers selected the highlights and strung together this 77-minute feature, augmented by some excellent extras (including Springsteen duetting with Paul McCartney at the 2012 Hard Rock Calling festival). Speaking of that festival footage, while we do get 35 minutes of Springsteen and the E Street Band’s performance, the full concert would’ve made this an essential purchase. As it is, the excerpt is the disc’s highlight, sounding incredible in DTS-HD MA 5.1. First up there’s “Thunder Road,” “Because the Night,” “Shackled and Drawn,” and “We Are Alive.” Then McCartney comes out and the band tears into “I Saw Her Standing There.” Though he’s been performing the song regularly for the past quarter century or so, McCartney seems genuinely inspired here by Springsteen’s energy and enthusiasm. They conclude with a rambunctious “Twist and Shout” before the crew tells them they’re past curfew. Why did I jump to the bonus materials first? Because Springsteen & I actually feels more like a bonus feature than a primary attraction. Most of the various fans’ recollections lean heavily toward “those were the days” nostalgia (i.e. “I lost my virginity to ‘Thunder Road’”). There’s a young Asian American truck driver who adds a welcome philosophical perspective to her explanation of what Springsteen’s music means to her. Another fan, an Elvis impersonator, was invited onstage to perform with Bruce and the band – he even managed to sneak in an encore of “Blue Suede Shoes” to his performance of “All Shook Up.” Not only do we hear the story, we see video footage of the exhilarating, once-in-a-lifetime moment. What keeps the film from being a wholly enjoyable love letter from fans is the almost worshipful tone it strikes. These aren’t just fans, their disciples of the Church of Bruce. Only one fan seems genuinely off-kilter (a woman who raised her son to refer to Springsteen as “daddy”), while some are quite frankly a bit boring. The appeal of Springsteen & I is limited to existing fans. I can’t imagine many new Springsteen devotees springing up as a result of it. That’s not necessarily a measure of the documentary’s worth. Just know going in that this isn’t a concert film or biographical documentary. Also available on standard DVD. Visit Eagle Rock Entertainment for more on this and other titles.